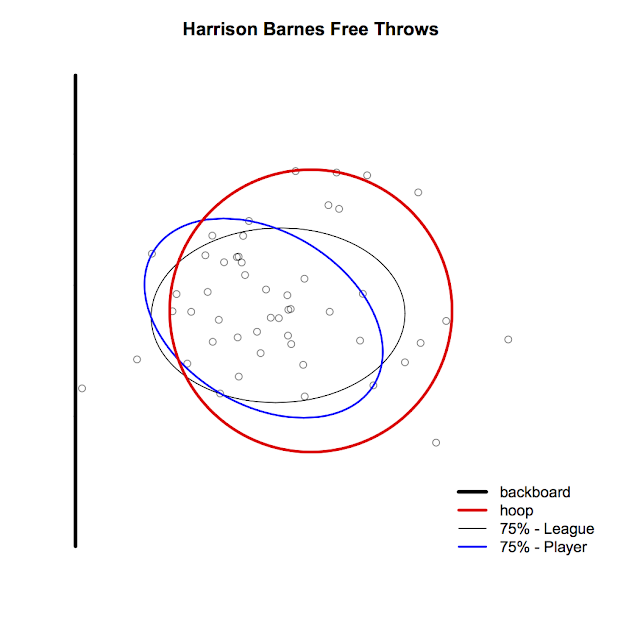 Last week's piece on the analysis of shooting arcs (which I pretentiously named "ShArc") received a lot of positive feedback, which was nice. As I indicated at the end of the post, there are about a hundred different directions I can take this, and any meaningful next steps will probably take place in the offseason. But since it is the eve of the NBA Finals, I thought I'd share some more data, as well as share an approach for creating a simple visualization of each player's free throw accuracy. 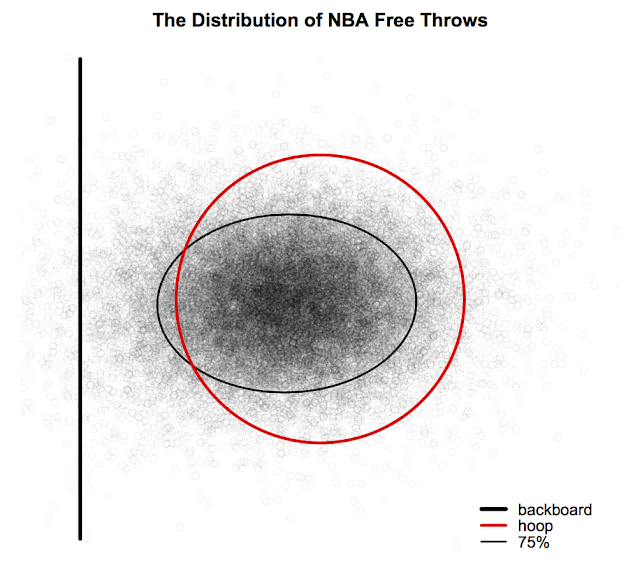 The chart below represents some 30,000 free throws taken in the NBA this past season, with each circle representing a shot and where that shot crossed the hoop's threshold. Scatter plots can be a great visualization tool, but when you've got thousands upon thousands of data points, the human eye can only discern so much. 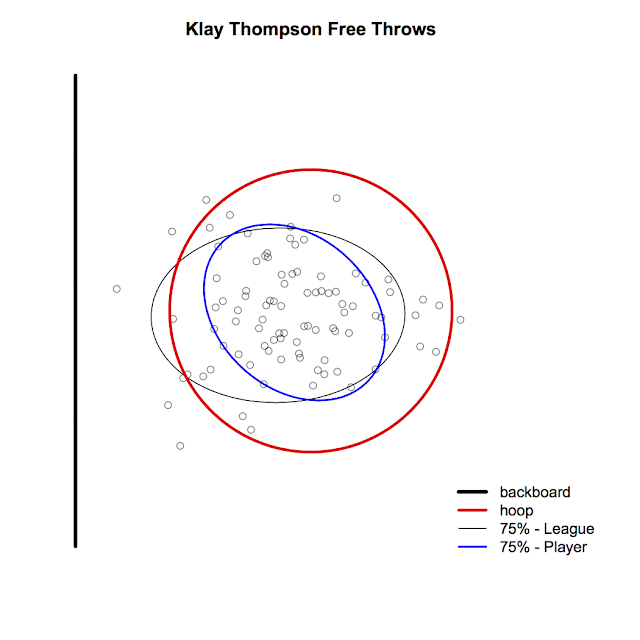 To make sense of the this chaotic scatter, I calculated a boundary ellipse around the data, defined as an one that encircles 75 percent of the data points within the smallest area (h/t to Rasmus Baath of R-Bloggers for the idea and code). What does this boundary ellipse tell us? For one, it tells us that variation in free throw shooting comes more from shots being too strong or too soft, as opposed to wide left or wide right. It also shows that the average target is not dead center of the rim, but closer to the back. 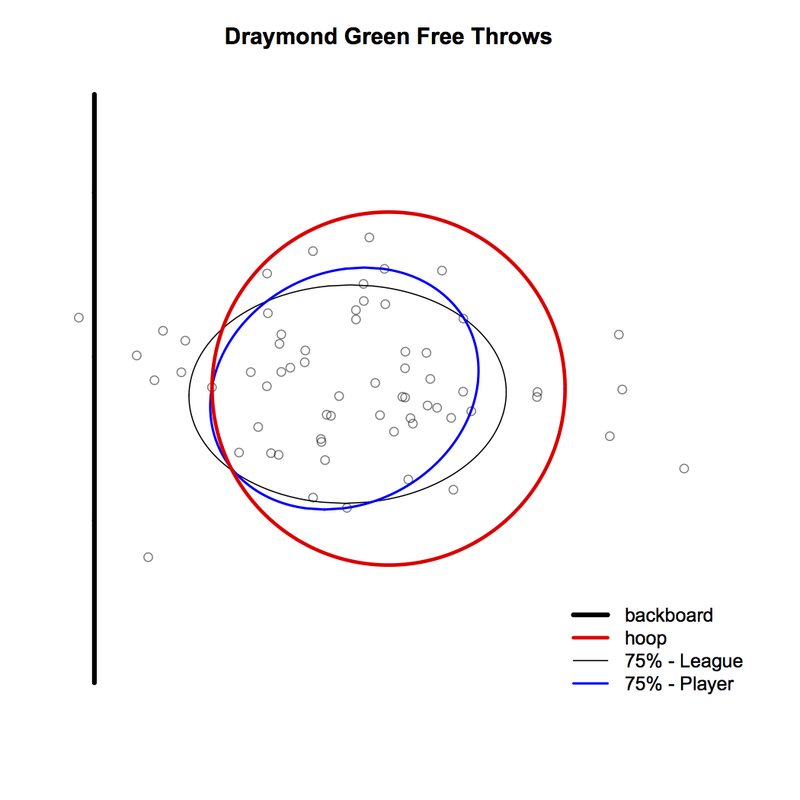 This makes sense, as shots that graze the back of the rim have a better chance of falling than those that make contact with the front. This boundary ellipse also provides us with a nice visual benchmark with which to measure individual NBA shooters. 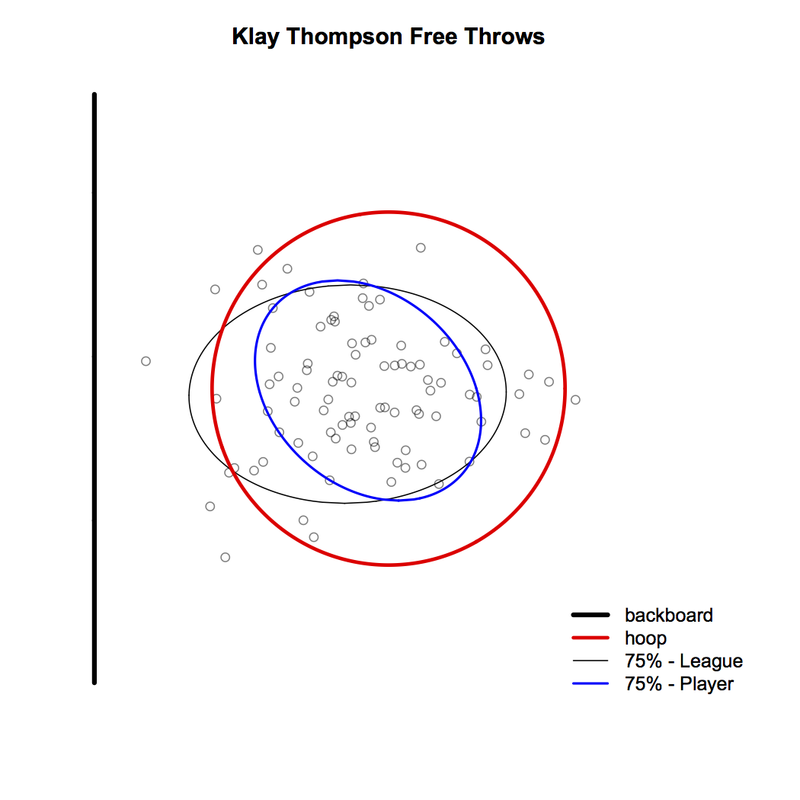 We can draw a similar boundary ellipse for each player, one that encompasses 75% of just their shots, and then see how that compares to the league ellipse. The five charts below put that idea into practice for four of the Warriors starters, plus Marreese Speights. 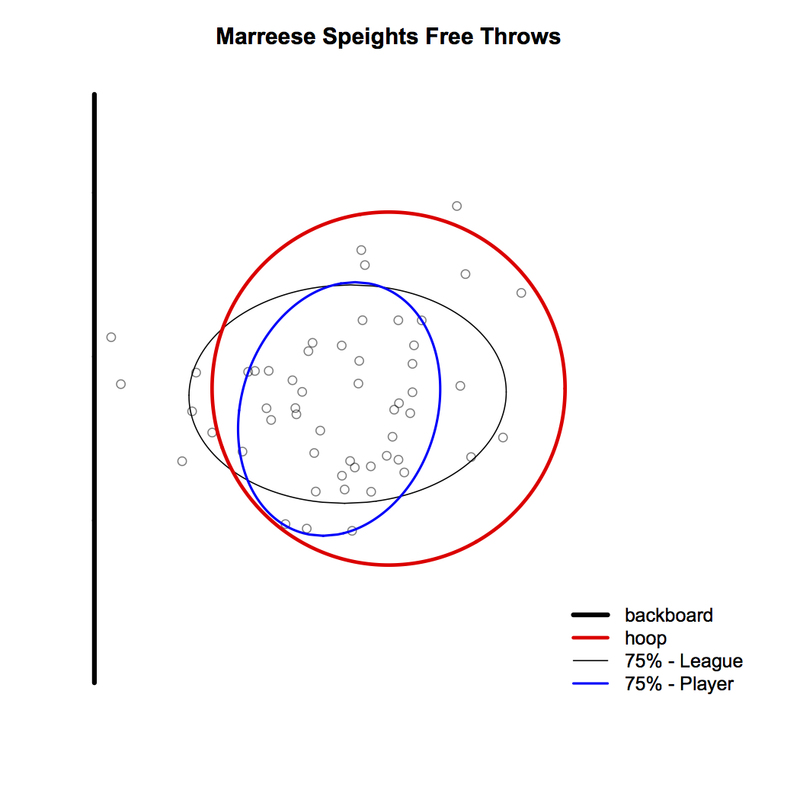 For whatever reason, Andrew Bogut's free throws are not showing up in my database, so I include Mo's shot chart in his place. Data cleanup will be an offseason project of its own. 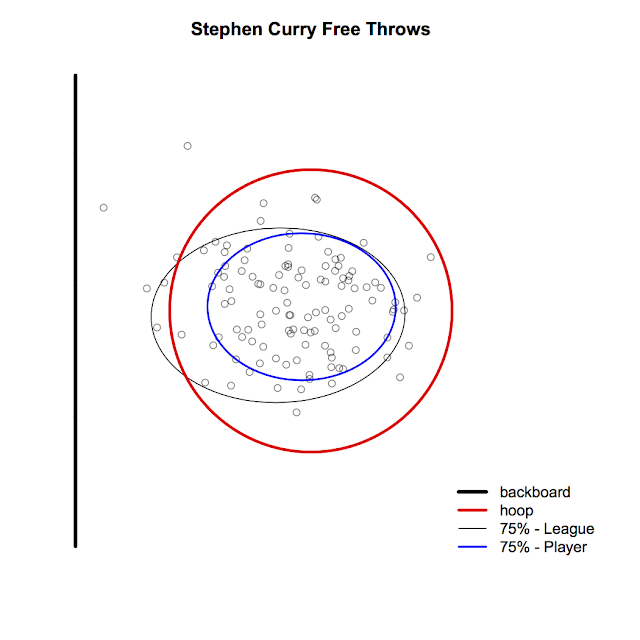 To the extent possible, I'll do my best to share additional data from this project as the Finals progress, starting with a follow up post on the Cavaliers.